I fondly remember Aesop’s Fables from my own childhood and Caterpillar has a slightly battered second-hand copy on his book shelf that we’ve been enjoying at bed time (as you know I love a children’s book with a lesson so fables obviously speak to me!). 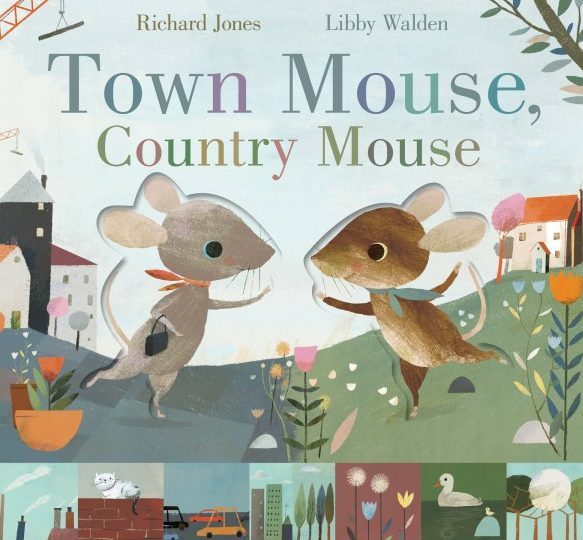 Town Mouse, Country Mouse by Richard Jones & Libby Walden is a modern, expanded version of the classic tale of two cousins who swap houses only to find they much prefer the comfort of home. I’ve previously reviewed Feelings from the same illustrator and this book has the same beautiful quality and soothing colour palette; with hardback cover, thick matt pages and wonderful peep element. Mr Jones’ illustrations are really unique and appealing with soft edges and beautifully drawn characters and environments. Caterpillar adored the peep-through element which is featured in a different way on almost every page. It’s so cleverly done where by the peep-through on the “country” page becomes a different feature on the contrasting “town” page. Particular favourites are the sun becoming the moon and the poisonous berries in the country becoming the jam label in the town kitchen. Really unique and inventive. Lovely illustrations aside, Libby Walden’s creative, rhyming prose is also a treat. As I’ve said countless times, the use of rhyme is by far our preference for children’s books and this book has a great flow as well as a wonderful message for young readers. Town Mouse and Country Mouse both discover that the grass isn’t always greener on the other side but also that it’s important to respect each other’s differences. You can buy a copy of this wonderful modern fable here. To read lots more book reviews, head to the Butterfly Book Club page. Disclosure: We received this book in exchange for an honest review, words and opinions are all my own. I remember this story and love that it has been given a creative makeover in this version, looks fab!